I spent a good deal of time in the kitchen preparing last night’s dinner, but it wasn’t hard at all! I decided to try something Spanish this time, and I researched many different recipes for paella. I settled on one, and the recipe is listed below. 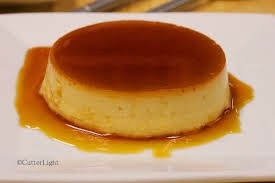 For dessert, I opted for flan. It was easy to prepare, but it could have looked a little better. At the last minute, my son called to ask if his girlfriend could join us. Of course I said ‘Yes,’ – I love her to pieces, but she’s from a Spanish background! I panicked, thinking my cooking endeavors might not meet her standards. However, I had little to fear – she praised the meal, as did my boys. I surprised myself, actually pulling off a brand new dish for me, and having it turn out so well. I began with the flan, since it had to cool in the fridge. I began by melting a cup of sugar over medium low heat. This step takes a while, so don’t get discouraged. Eventually it liquefied, and turn a deep golden color. Stir it to make sure it’s smooth. Then beat three eggs in the mixer until light. Add a can of condensed milk, a can of evaporated milk, and a teaspoon of vanilla. Pour the egg mixture over the sugar in the baking dish. Cover the dish with aluminum foil. I forgot this step, and it meant my end product was browned. Instead it looked like this. No aluminum foil, and the plate slipping left me a less-than-pretty dessert. Cool completely in refrigerator, and cut into slices. It’s very sweet, so be forewarned! My guys loved it, though. In one tablespoon of oil, in a large skillet, cook one pound of medium or large shrimp until pink. Add another tablespoon of oil and brown one pound chorizo (Spanish sausage) that has been cut into ½ inch slices. Add one medium onion finely chopped, and cook until the onion turns translucent. Stir until the rice is covered and translucent. Add a 14.5 ounce can of diced tomatoes (I used the fire-roasted ones) and one box of chicken stock . Add salt and pepper to taste, and cover with a lid. Bring to a boil, then lower to simmer. Cook for about a half hour until all the liquid has been absorbed. I put it into a big bowl and served it with crusty rolls. That was it, and it was yummy! Next week, I think we’ll travel to Italy! It really does speak to how accomplished a cook you are that,with one hand figuratively tied behind your back, you can attempt and succeed at something as challenging as creating a good paella. Congratulations! No, no -- just simple endeavors! My hand is more like a dead weight, so I CAN use it to hold things down at times. Also, my husband assists when it involves sharp knives. However, he refuses credit,saying, "With praise comes responsibility!" HI MUFF - wow, so yummy. And I love your detailed, easy to follow, step by step directions with pictures. Very impressive. I am excited to be making bread pudding this Saturday. Yum. We are using cinnamon raisin bagels rather than bread. We will make it together as I am quite awkward in the kitchen given my hand/wrist issues. Snow is expected from Saturday through Tuesday so we plan on staying in and enjoying some nice meals and wine and our bread pudding. Have a great day. I love bread pudding, and your way sounds yummy. I will have to try it! No snow for us -- again. I love that idea of "visiting" other countries through cooking. I have never prepared Spanish food, but I went to "Spain" the restaurant in Rhode Island and the food was excellent and the service beyond belief. It was my boys idea to go around the world with food. We'll see how far we can go! i always enjoy step by step pictures!! it's all about taste, presentation only matters when it looks amazing!!! the spanish dish looks really yummy, i like one dish meals. glad it was a hit!!! I like those one-pan meals, too. My large skillet is non-stick, so it's twice as nice! We love garlic, although at times my tummy doesn't. I find that using the jarred garlic in oil is better digested.